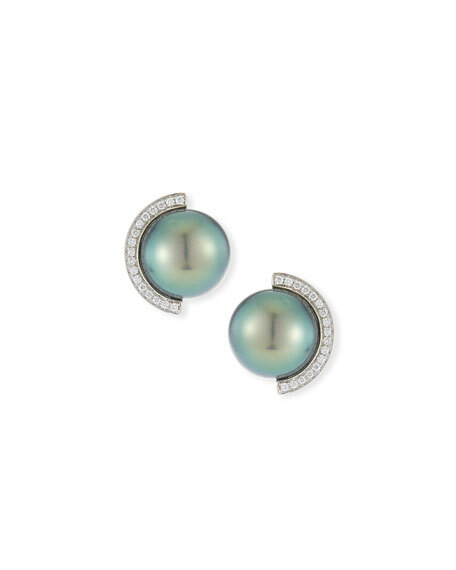 Belpearl diamond half-halo pearl stud earrings. Polished 18-karat white gold hardware. 11mm naturally hued Tahitian cultured pearls. White diamond pavé half halo. 0.16 total diamond carat weight. Behind every BELPEARL Collection is the desire to showcase the beauty of the pearl in a unique, elegant, and luxurious setting. BELPEARL has specialized in rare pearls for over three generations, and reserves only the finest pearls for use in their exquisite collections.